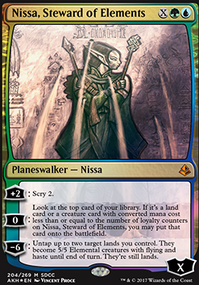 Whenever Thief of Sanity deals combat damage to a player, look at the top 3 cards of that player's library. 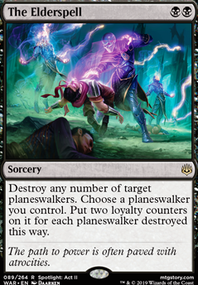 Exile one of those cards face-down, then put the rest into that player's graveyard. 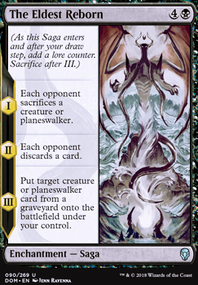 You may look at and cast that card for as long as it remains exiled, and you may spend mana as though it were mana of any colour to cast that spell. 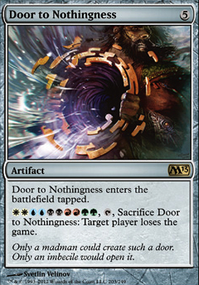 Hey there, to follow up with the trade for my Wurmcoil Engine (22.55), would you do the following: Attunement (4.69), Fabricate (4.27), Godless Shrine (8.51), and Thief of Sanity (4.87)? Prices are using TCGPlayer Market price, if that's acceptable for you. The total on your end would be $22.34 vs $22.55 for the Wurmcoil. Maybe Spell Pierce or Syncopate instead of Quench for better early game countering since Sinister Sabotage kind of fulfills Quench 's role already. 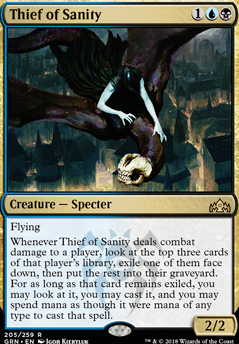 I also feel like Thief of Sanity although a great creature doesn't fit in this deck too well. Instead maybe add another copy of the more fitting creatures maybe.